Composite experts at the University of Sheffield Advanced Manufacturing Research Centre (AMRC) with Boeing in Rotherham, have been recognised for their work on a collaborative project with counterparts in South Korea. The AMRC's £4.5m composites centre on the Advanced Manufacturing Park (AMP) provides a full range of design, manufacturing, assembly and structural testing services for advanced composite materials. The centre also works with complex hybrid components and systems, which require manufacturing expertise in both composite and metallic structures. Carbon fibre composite materials are increasingly used in aerospace, marine, automotive and other high-value industries for their combination of light weight and high strength. Researchers Jounghwan Lee, Richard Grainger and Kevin Mee were part of the team that won the JEC Asia award for innovation in automotive applications for their work on developing a complex composite acoustic cover for a car engine bay that can be cured in an industrial microwave. The AMRC team carried out the research in partnership with South Korean research centre KCTECH (Korea Institute of Carbon Convergence Technology) and the Ssangyoung Motor Company. Economic and environmental drivers have forced the composite manufacturing industry to consider moving away from traditional oven or autoclave curing, which has high energy costs and long cycle times that are not suitable for large production. In addition components are subject to pressure, as well as heat in ovens or autoclaves. Microwave energy penetrates into the material and energy is not wasted heating the rest of the oven. Using microwaves reduced curing time and energy consumption by up to 30% for the acoustic cover and further gains are expected following additional research. Jounghwan Lee, research engineer at the AMRC (pictured), said: "It was great to win this prestigious award for our first collaboration with KCTECH. 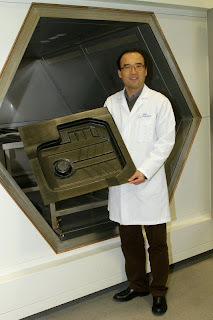 "Microwave curing is a new technology, which has only been used for simple shapes in the past. It offers a number of benefits over other methods, including saving time and energy. "We had to undertake a lot of research and development to satisfy all the requirements and to make the part successfully." The AMRC Composites Centre joined forces with KCTECH to collaborate on developing novel technologies in 2012 following a visit to the AMRC by KCTECH's president and the mayor of Jeonju City, in South Korea, where the company is based. The Centre is now working on a further project with KCTECH to develop a novel manufacturing process to make automotive leaf springs using composite materials, which would be lighter and more energy efficient and also give car passengers a more comfortable ride.